WASHINGTON (CNS) — U.S. Catholics have donated close to $59 million to relief and recovery efforts in response to the destruction caused by three hurricanes that hit the United States and the Caribbean and two earthquakes in Mexico last year. The devastation from these “unprecedented disasters continues to impact the lives of our brothers and sisters in the United States, across the Caribbean and in Mexico,” said Archbishop Thomas J. Rodi of Mobile, Alabama, chairman of the U.S. bishops’ Committee on National Collections. The U.S. Conference of Catholic Bishops in a news release reported the various amounts raised for disaster relief as of mid-May: Hurricane Harvey, $37.2 million; Hurricane Irma, $12.8 million; Hurricane Maria, $6.1 million; Mexico earthquakes, $3.5 million. 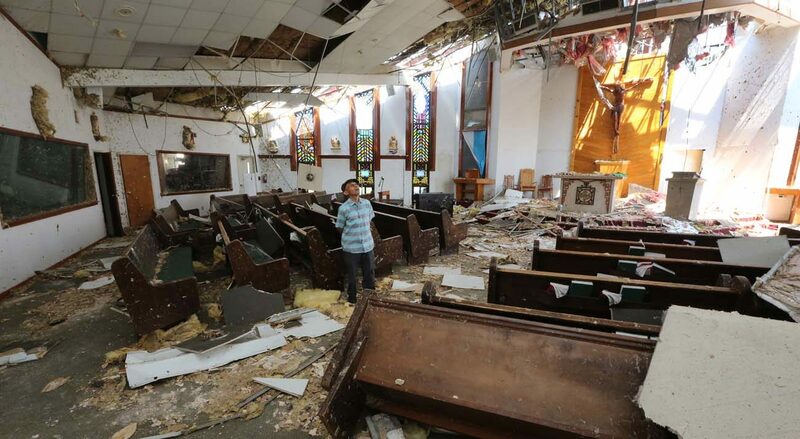 The USCCB initiated the special collections and funds that were launched last year to support humanitarian relief efforts as well as to provide pastoral services and financial support to rebuild facilities in dioceses impacted by these disasters. Catholic Charities USA, a national network of social services agencies in U.S. dioceses, and Catholic Relief Services, the U.S. bishops’ overseas relief and development agency, are providing humanitarian relief and recovery efforts. Catholic Charities USA, based in Alexandria, Virginia, is receiving 50 percent of Hurricane Harvey funds and 30 percent of both Hurricane Irma and Hurricane Maria funds; Baltimore-based CRS is receiving 20 percent of Hurricane Irma funds. The USCCB said that initial funding from the special collections supported immediate needs such as food, clean water, hygiene products and shelter and now long-term disaster recovery is underway. It said Catholic Charities USA recently distributed $13.5 million to nine Catholic Charities agencies in Texas and Louisiana where Hurricane Harvey affected countless people. CRS worked with Caritas Havana in Cuba to provide roofing and mattresses to affected families in response to hurricanes Irma and Maria. In the British Virgin Islands, CRS, Caritas Antilles and the British Red Cross set up a joint cash program to help 740 families buy essential items. In Dominica, CRS and Caritas Antilles distributed 750 hygiene kits, 1,590 tarps, 920 buckets and 660 water filters to more than 600 families in four communities in the hardest-hit southeastern region. In the Dominican Republic, agencies that partner with CRS provided 1,970 families with vouchers for food, hygiene and living supplies, and 330 families with hygiene kits. Teams also worked with the local health ministry to raise awareness about health and hygiene, particularly the danger of waterborne diseases and other health risks. Two Mexico earthquakes days apart killed nearly 500 people in September 2017 and destroyed homes, infrastructure and utilities. In response, CRS, Caritas Mexico and local partners constructed transitional shelters and distributed 2,859 tarps to vulnerable families. They set up communal cooking facilities to ensure daily hot meals and provided living supplies; they also arranged for counseling for children and young people dealing with trauma caused by the earthquakes. The USCCB said CRS plans to train people to rebuild using disaster-resilient construction techniques and to maintain their emergency shelters. The USCCB Subcommittee on Catholic Home Missions is managing the U.S. church’s share of hurricane relief funds for Harvey (50 percent), Irma (30 percent) and Maria (55 percent). The subcommittee has awarded $14 million in Hurricane Harvey grants, and $3 million in Hurricane Irma grants to assist with church repairs to parishes and schools in dioceses impacted by the hurricanes. In June when the subcommittee meets during the U.S. bishops’ spring assembly in Fort Lauderdale, Florida, committee members will consider requests from dioceses in need of Hurricane Maria support. The bishops’ Subcommittee on the Church in Latin America is managing the Caribbean church’s share of hurricane relief funds for Irma (20 percent) and Maria (15 percent), as well as all contributions to the fund for Mexico earthquake relief.